Erwin Tulfo of PTV News reports that the Presidential Electoral Tribunal (PET) made the discovery of multiple unused yet pre-shaded ballots with no other than Leni Robredo’s name in reservation to the Vice President’s position. This is what truth that surfaced after the third day of manually recount that is being done due to former Senator Bongbong Marcos’ electoral protests. The pre-shaded ballots apparently came from Bahaw and Bato, Camarines Sur. Bongbong Marcos’ lawyer, Atty. Vic Rodriguez, stated that there was nothing surprising about the location of the ballots, but its contents was what undeniably astonished them, pre-shaded ballots in favor of of Leni Robredo. A couple of days before that, the issue on wet ballots and lost audit plugs also came into existence. 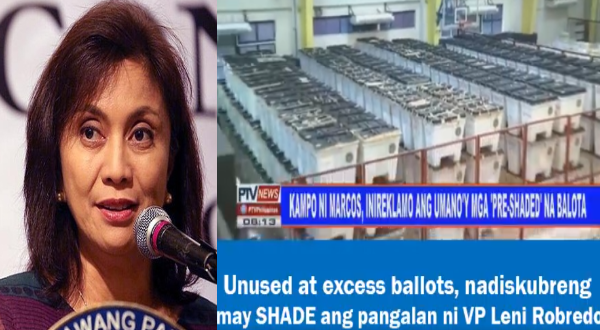 Robredo’s side could only reason out that a storm that went pass Bicol Region is what’s responsible for the soaking of the ballots in the warehouse that it is stored in. “Ito na ho ang katotohanan, sumasangulat na. Ung mga balotang hindi dapat at wala dapat shade ay pre-shaded, ung mga boto na hindi dapat ibinilang ay ibinilang,” Rodriguez stated. Now on the same day as the discovery of pre-shaded ballots, in another precinct, Rodriguez reveals that another set of unexplainable wet ballots were uncovered. This was a part of the initial discovery during the first day of the manual recount where 5 precincts were known to have acquired wet ballots. Marcos’ side felt relief after the slowly and steadily revelation of the truth that Robredo’s seating into power is proven to be unrighteous in origin. “We’ve given them all the elbow room. Now take the high ground and consider resigning and returning ang position na hindi naman talaga sayo dun sa duly elected Vice President of the Republic of the Philippines, si Senator Bongbong Marcos,” Rodriguez pointed out. The Commission on Elections cannot relay any statements due to the “Gag order” from the Supreme Court while the manual recount is still ongoing. The sense guilt and fear is probably creeping up the neck of Robredo as her lawyer cannot be contacted to defend their stand on his client’s illegitimacy. Nor did she ever release a statement to explain such discoveries.